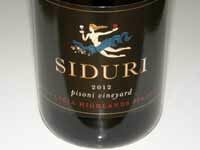 Winemaker Adam Lee of Siduri Wines told me, “2012 is a winemaker’s dream and a wine writer’s nightmare because nothing exceptional happened.” It has been jokingly called the “Goldilocks Vintage,” because it was not too hot and not too cold. The growing season was moderately warm without excessive heat spikes. 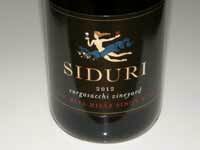 The result is dreary wine writing but really good wines. In 2012, bud break, flowering, set and harvest were generally on time. Yields were remarkably large, especially in the Russian River Valley and Sonoma Coast, and only slightly larger than normal in the Santa Lucia Highlands and Sta. Rita Hills. Yields in Oregon were below normal, but the quality of the fruit was extremely high. The result was that Adam did quite a bit of bleed off (saignée) particularly in Sonoma County, varying anywhere from 10% to 25% depending on the lot. Generally acids were in line and Adam felt comfortable doing a slightly higher percentage of whole cluster on the ferments. He did inoculate more than usual, mainly late in the season as he was running out of room. A number of 2012 wines were ready to go and bottled in August but some have been kept back until January for bottling. The wines are gluten free and vegan friendly. All wines are bottled under screw cap closure. 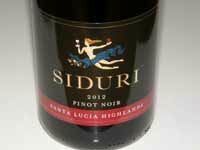 Overall the 2012 Siduri Pinot Noirs show more flesh than in 2011 and are quite inviting at this young age. Still, the vineyard-designated wines will benefit from another 6 to 12 months in bottle. Some of the vineyard-designated wines are stunning in 2012. The new labels for the 2012 vintage are very classy.